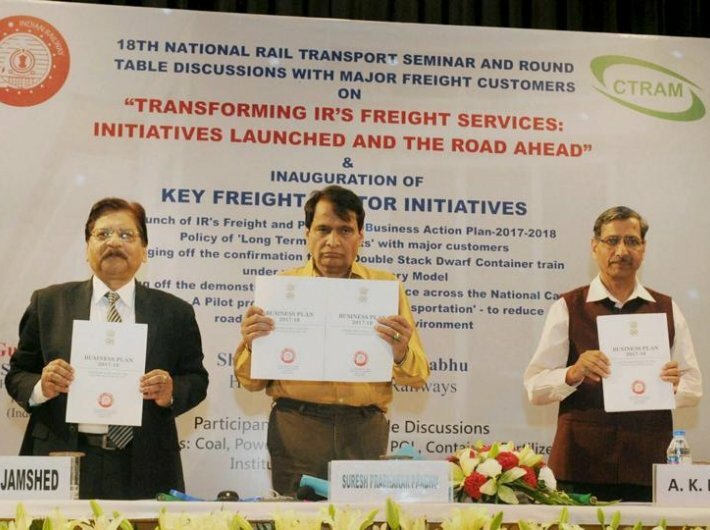 Suresh Prabhakar Prabhu, minister of railways, on Thursday, unveiled – what he called the ‘mini budget’ – a freight policy called the ‘Freight and Passenger Business Action Plan 2017-18’. The business plan entails 50 initiatives including the policy on ‘long term contracts’ with major customers, trial of double stack dwarf container train and demonstration run of Ro-Ro (Roll on – Roll off) service. The railways saw a dip in freight earnings in the current fiscal due to sluggish coal transportation. The minister announced the business plan to increase revenue and ensure easier travel for passengers. Prabhu accepted that over the years the Indian Railways’ share in the country’s total traffic has slashed substantially. He said that the ministry is addressing its transportation policy in a holistic manner. “Railways earns its two-third revenue from freight only and from the transportation of eight commodities. Due to global slowdown, transportation sector is the biggest sufferer leading to reduction in freight earnings. However, despite these challenges, the railways has done well to improve its freight loading,” he said. The railways has been constantly changing its freight policies and rationalising them in consultation with stakeholders to attract more freight. Besides, the Railways has adopted market oriented approach to make traffic policies. The business plan 2017-18 envisages upgradation of delivery system by revamping railway goodsheds through partnerships with stakeholders, new delivery models like Ro-Ro, dwarf containers, road-railers (between Palwal and Melpakkam) and new terminals. The Ro-Ro is a pilot project for ‘green transportation’ to bring down road congestion and ensure clean environment. It will be useful for reducing pollution and for speedy transportation. Prabhu lauded the concept of double stack dwarf container train which would save time and will be cost effective. “Of late the Railways has initiated measures in the field of non-fare revenue and in saving fuel cost. We have fixed a target of savings Rs 41,000 crore in the next ten years on energy,” Prabhu said. The plan includes inititaives for better freight services and rationalised tariffs to expand the freight basket (commodities like bulk cement, steel products etc. to be taken out of restricted list for containerisation), long term contracts with freight customers, end-to-end solutions, rationalisation of weighment policy, Timetabled trains with premium on assured transit time (50 paths to be carved out in 2017-18) and procurement of specialised rolling stock for sectors like automobiles. Some of the major plans of the railways include international freight services under which a demo train run between Bangladesh and India, and a meeting of CEOs of railways of the concerned countries to strengthen intermodal regional connectivity. The strategy aims at enhancing throughput like procurement of 3,000 25T BOXNS wagons in 2017-18, leveraging IT and improving asset utilisation. The minister said that with the improvement in freight loading, everybody will be benefiting, be it the railways, the consumers or the entire ecosystem. The Railways is working in line with the prime minister’s broader development agenda. Chairman, railway board, AK Mital said that enhancing more traffic share is a big task for the Railways and all stakeholders must work together to achieve this dream. Migrating towards cashless, paperless, ticketing (6000 PoS machines and 1000 ticket vending machines in 2017-18). Aadhaar-based ticketing and a ticketing app by May 2017. New train products like Humsafar (7 new services by 2017), Antyodaya (7 new services by June 2017), Tejas (3 new services by June 2017) and a new policy for rail tourism including development of hill Railways through partnerships besides several new tourist-friendly packages.